It’s taken a bit of time because Jim has been taking a pair of curtains to a seamstress in Corinth, Mississippi, one or twice a week off and on for the last two months. Some weeks he worked remotely and did not go to Corinth, and one week the seamstress, known as Granny, was on vacation, but we have all of the curtains up, and only a couple of pairs more need to be hemmed (these are already hanging in the bedroom). The reason we’ve been taking in a pair at a time instead of everything at once is because these curtains really work, and with almost the entire month of July with daily highs in the upper 90s, we did not feel we could remove all of the curtains (we put them up to keep the heat out before being hemmed) at the same time. 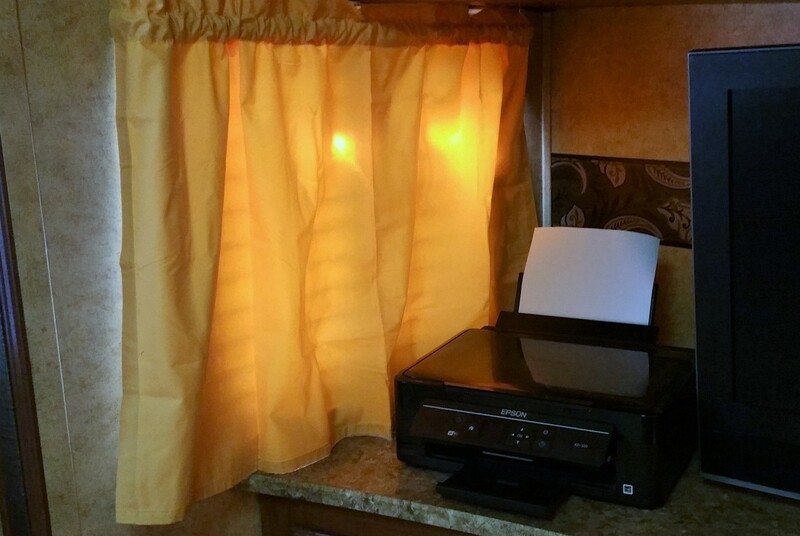 Having these thermal curtains up helps tremendously in keeping the heat out (and will help with keeping the warmth inside in winter), so our air conditioner does not have to work so hard to keep our 5th Wheel comfortable. This is also why most of the curtains are pulled shut in the photos. 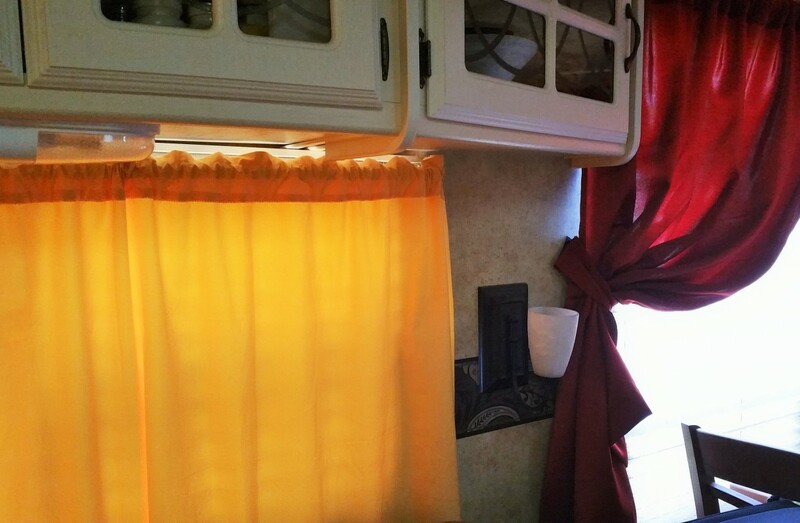 If you saw the earlier post Beginning to Make It “Ours,” Part 2, you know that we went with red curtains in our dining and kitchen area; we used the golden yellow in the living area and bedroom. The curtains pick up some of the colors in the material used to recover our dining chair seats (visible in pictures in post linked above). 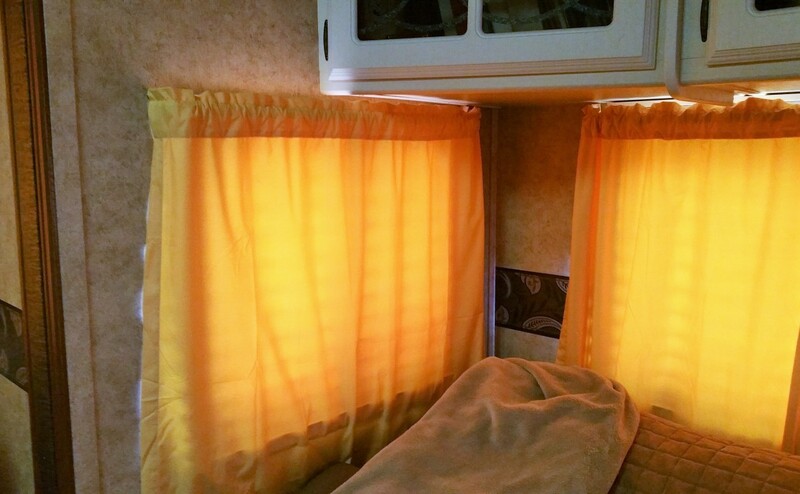 If you are having trouble keeping your camper cool in hot weather and warm in cold weather, we can strongly recommend using thermal curtain panels.